I've stumbled across something new to me on my way back from yesterday and today's Lexus GS launch: little cabins at Munich airport which let you work or sleep in privacy, right in the middle of a bustling terminal. These cosy 'napcabs' offer a sole occupant the chance to watch films, check email, surf the web, sleep or even receive an alarm or flight call. I just had a peek inside one and can report that it looks surprisingly inviting. If my plane had been delayed, I might well have considered making the required 15 euro investment per hour. 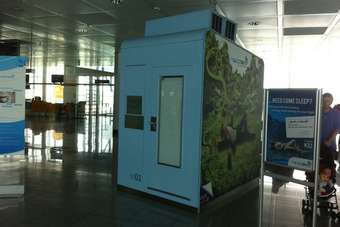 Could these little huts become a new big thing at airports the world over?